The Frioul archipelago, off Marseille. The Frioul archipelago is a group of four islands located off the Mediterranean coast of France, approximately 4 kilometres (2 miles) from Marseille. The islands of the archipelago cover a total land area of approximately 200 hectares. If Site of the Château d'If, where main fictional character in Alexandre Dumas, père's The Count of Monte Cristo was imprisoned. Tiboulen du Frioul or Îlot Tiboulen Meaning "In front of the city" in Provençal, after the Latin antipolitanus. 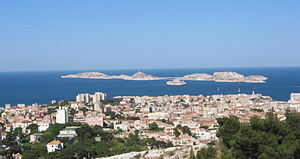 The islands of Pomègues and Ratonneau are connected by a mole built in 1822. Wikimedia Commons has media related to Frioul archipelago. This page was last edited on 16 February 2019, at 12:33 (UTC).